Knife Spiderco mod. C10PVK is folding / pocket knife Endura series. 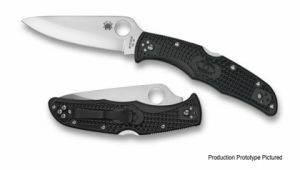 Designed for use with unilateral Daily smoothly sharpened blades made of stainless steel grade VG-10.Black synthetic handle FRN (a combination of nylon and fiber glass). Clip one side. Made of stainless steel with black matte finish.